Nibblers cut through a variety of metal building products much like a jigsaw cuts through wood. 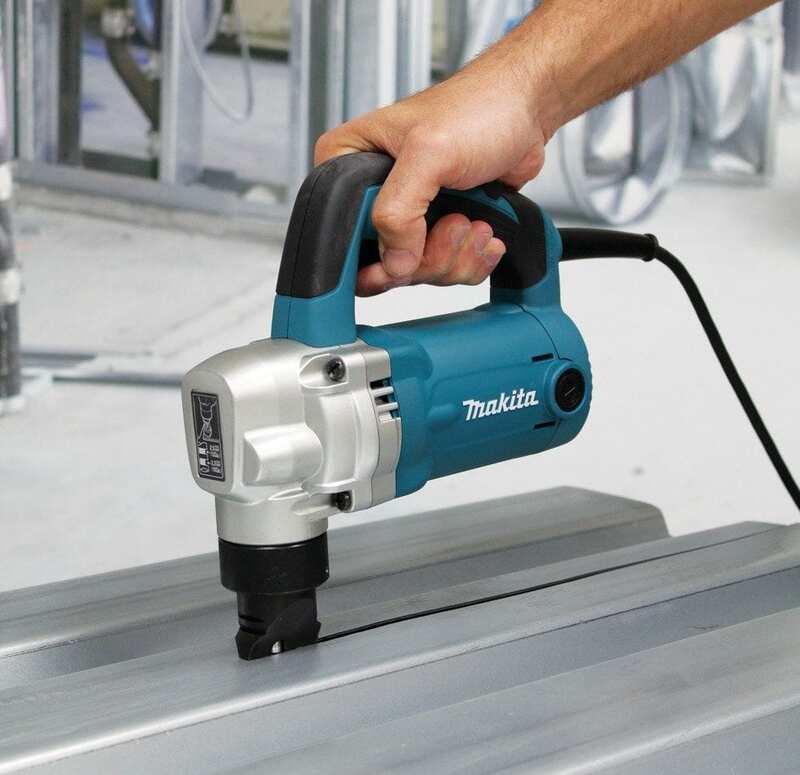 A nibbler is one of those odd tools that, although they are a staple in many shops and HVAC contractors and carpenters that work with metal roofing and decking swear by them, are completely unknown to a large part of the construction community. Basically a replacement for hand snips and shears, a nibbler cuts through metal like a jigsaw, but instead of a blade, a nibbler uses a sharp punch that moves up and down through a die to make the cut. 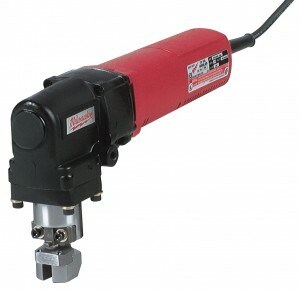 Metal shops typically use pneumatic versions, while contractors typically prefer electric or cordless models. To choose a nibbler for a specific task you need to know a few basic specifications. The cuts are made by a punch-and-die setup instead of a blade. Instead of sawdust, little metal chips are the byproduct. 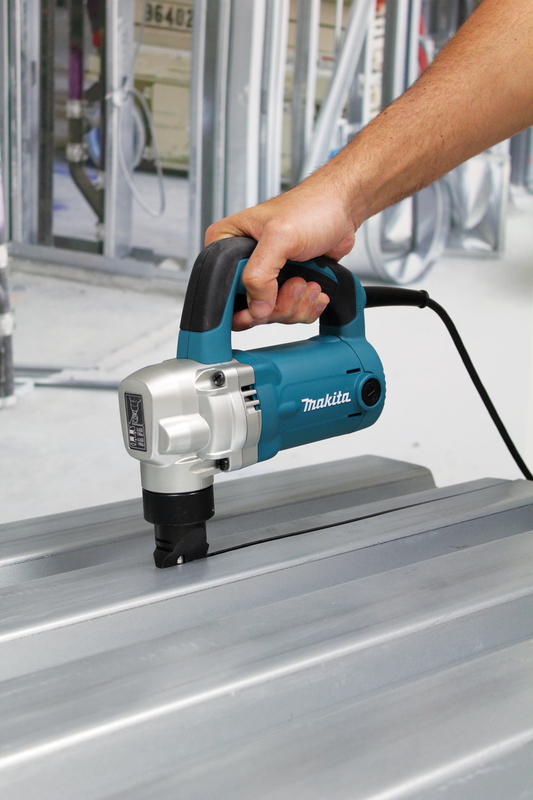 Capacity – The nibbler’s packaging and operating manual will tell you the cutting capacity for the tool, which will typically range from 8 or 10 gauge (thick) to 18 gauge or more (thin). 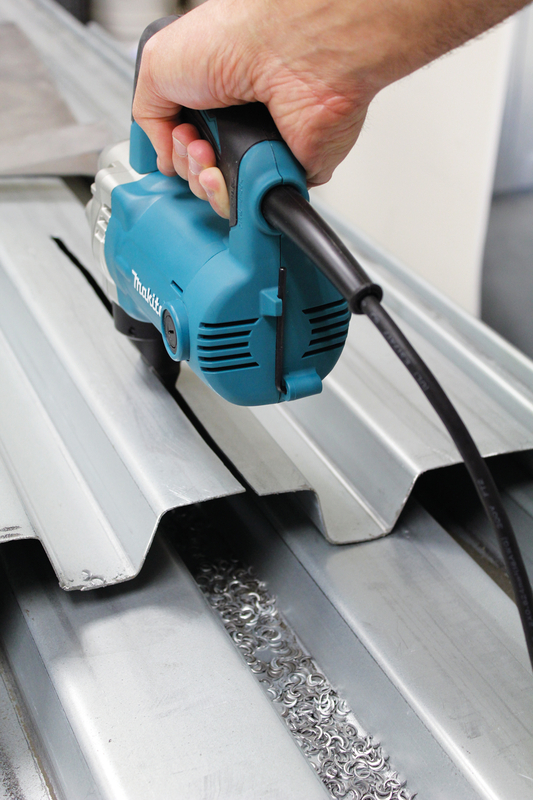 The type of material will affect cutting capacity – a particular nibbler might be able to cut 12-guage aluminum, but only 14-guage stainless steel. Strokes per minute – Most non-specialty nibblers range from 1,300 strokes per minute to about 4,000. Generally, the nibblers with fewer strokes per minute are used for thicker gauge material. Minimum cutting radius – If you’ll be making a lot of tight-radius cuts, the minimum cutting radius is an important specification. These are listed by both inside and outside cutting radius, with the difference coming from the kerf thickness of the cut. These will typically range from 1¾-inches inside radius to about 4¾-inches for bigger nibblers. Using a nibbler is much like using a jigsaw. The main difference is there is no table on the nibbler to ride along the material. Make sure the body of the nibbler remains parallel to the material you are cutting or the tool will bind. In this picture, you can see the punch resting in the die at the end of the tool’s nose. The material to be cut rides along the groove in the die, and the punch will stroke up and down to cut through. 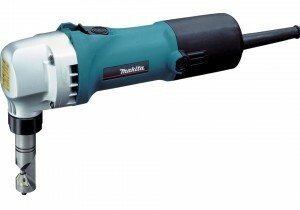 If you are starting a cut in the middle of the material, use a drill to create a starter hole. The minimum starter hole radius is also specified on the tool’s packaging. Also, if you are ending a cut in the middle of the material, you’ll typically have to back the tool out of the cut. You usually can’t lift the tool out of the kerf. The grooves on the barrel of the upper nose of this tool are gauge guides. If the edge of the material you’re cutting doesn’t fit in these guides – you shouldn’t be cutting it with this tool. When cutting, you can turn the material if you are working on a small piece or turn the tool much like a jigsaw. Most nibblers feature a die holder that rotates so you can prevent the tool from bottoming out against any obstructions. To make precise or straight cuts, you can use a variety of shop-made jigs, templates, guides or straightedges. Be aware of where the metal chips land as you cut. These can be extremely sharp and can cause injuries or mar the surface of finished pieces. The chips from some nibblers will just fall out anywhere, while some tools direct chips downward. The cut will have sharp edges and burrs that may need to be flattened or deburred. Depending on the intended use for the piece, you can use a hammer to flatten the edges against another hard surface or polish the edges with a grinder or metal sander.